Basketball coaching legend Steve Konchalski, head coach of the StFX X-Men; long-time wrestling coach and administrator Francis Clayton; and television personality Tim Micallef were honoured by Canadian Interuniversity Sport on Wednesday night, June 9. The awards banquet was held at the Mont-Tremblant Conference Center in Mont-Tremblant, Que., as part of CIS’ annual general meeting. Konchalski – Coach K, as he is known – is the recipient of the Jean-Marie De Koninck Coaching Excellence Award, presented since 2007 to an individual who has made an outstanding contribution to university sport as demonstrated by long-term commitment and leadership as a coach at the local, provincial national and/or international levels of Canadian university sport. 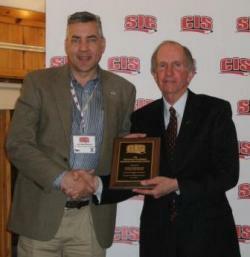 Clayton received the Austin-Matthews Award, presented annually to an individual who has made an outstanding contribution to interuniversity sport, as demonstrated by his/her long-term commitment and leadership as a coach, director, chairperson and/or executive committee member at the local, provincial and/or national levels of Canadian interuniversity sport. Micallef received the Fred Sgambati Media Award, presented annually by CIS to a member of media in recognition of his/her major contribution to the development and growth of Canadian university sport. Konchalski, who completed his 35th season at the helm of the X-Men in 2009-10, is the winningest coach in CIS men’s basketball history with a career overall record of 755 wins and 403 losses (.652). Coach K surpassed former Brandon bench boss Jerry Hemmings (734 wins) on Nov. 6, 2009 when his troops defeated UPEI 94-83 in Charlottetown. Over his distinguished career in Antigonish, NS, Konchalski has led the X-Men to 34 consecutive playoff appearances dating back to 1977, nine AUS titles, 14 appearances at the CIS championship and three national crowns in 1993, 2000 and 2001. Named CIS coach of the year at the end of the 2000-01 campaign, he has received the same honour from AUS on six occasions, most recently in 2005-06. A graduate of Acadia (1966) and Dalhousie (1969), the native of Elmhurst, NY, claimed a CIS title as a player with the Axemen back in 1965 when he was named MVP of the national championship. While coaching at StFX, he had a 16-year stint as an assistant with the Canadian national team from 1972 to 1988 including three Olympic Game appearances (1976, 1984, 1988) and had a second tour of duty with the national squad from 1995 to 1998, this time as the head coach. Since 2009, he has been a member of Basketball Canada’s Council of Excellence, serving as an advisor to the national team program. Konchalski was inducted into the Canadian Basketball Hall of Fame in 1993 (coaching category), the Acadia Sports Hall of Fame in 1994 (athlete), the StFX Sports Hall of Fame in both 2001 (builder) and 2008 (team – 1993 CIS champions) and the Nova Scotia Sports Hall of Fame in 2007 (builder). In 1999, he was the inaugural recipient of the Frank Baldwin Memorial Award for dedication to basketball in Nova Scotia.